I turn 40 this year. For some reason, that didn’t hit me until now, in late January, rather than on my 39th birthday in early December. On that day, I simply felt grateful. Thankful for my family and friends and the various ways God has blessed me throughout my life. Content with doing a small celebration at home, chowing down the best Jenn Diet-friendly chocolate cake my husband could whip up. Normally, I don’t like birthdays. They make me feel old and unaccomplished. Even when I was a kid, I’d get a little glum when my “special day” rolled around. Something about staring down a spreading wildfire of candles bothered me. I didn’t welcome the prospect of aging, or the simmering doubts about not making the most of my time up to this point in life. So when I turned 39 and felt fine, that should’ve been a red flag. I should’ve known the birthday blues would be delayed. Once our family emerged from the lazy, disheveled days of Christmas break, I took a moment to catch my breath, sit down, and launch an undertaking I haven’t attempted in years: I created goals. Specifically, writing goals. It was a project some friends in my writing group were tackling, and I thought, naively, it’d be a good assignment for me to do, too. Setting goals is a good practice. It prioritizes tasks, focuses your concentration, and provides a framework for implementing disciplinary tactics to help you avoid distraction and reach your desired outcome. I used to set goals for various activities – school, swimming, work, family, even spiritual life. I hit those early versions of read-the-Bible-in-a-year plans pretty hard. The process of establishing goals fit nicely with my overall zeal for planning. Color-coding, outlining, inserting tabs – all of it gave me an organizational rush. To be sure, my planning fanaticism needed to be dialed down. But instead of a slow easing off the gas, God chose a different way to reorient this mindset, which at its core, was rooted in sin. He decided to crash the whole dang bus. Loss of my sister-in-law. Loss of my emotional stability. Loss of my fertility. Loss of my emotional stability again. Loss of my ability to manage (manipulate) my kids. So many facets of life twisted sideways, spinning out of control. My illusion of autonomy shattered. It needed to so I could more clearly see the goodness of God’s will. Necessary as it was, the process of destroying a habit 30-plus years in the making wore me out. I began to dislike planning. Although I couldn’t avoid scheduling activities altogether, I stopped making notes about what I hoped to do or see happen. I didn’t want to aim for dreams or anything remotely unfeasible. Fear of disappointment numbed my desire to create goals. Why bother? If you can’t reach ’em, don’t set ’em. This was my modus operandi the past several years. Then the topic of goals came up in my writing group, and I got to thinking about it again. Maybe I should do this. A little organization might help me stay on track and avoid wasting time. I took the plunge and immediately regretted it. Trying to establish goals for a new year requires you to look back on the past and assess where you’re at now so you can determine how to move forward. And that’s what burst my bubble before it had time to inflate. Last year, I decided to stop writing at my own blog in favor of freelance writing for other publications, specifically in the evangelical Christian genre. Since that time, I’ve had several articles published at different sites – all God’s grace; not my effort. But that wasn’t what fixed my attention. Instead, I focused on the failures: I didn’t write as much as I’d wanted to. I didn’t grow a platform by any significant standards (a whole subject that feels gross to me). I didn’t start a book proposal. I did get rejected by multiple publications at least 20 times. Taking inventory of these shortfalls discouraged me and demonstrated why I don’t like assessment-type exercises in the first place. They don’t merely give feedback on performance and provide measurable ways to improve; rather, they showcase my inadequacy. Thinking about your failures is bad enough. Thinking about your failures in lieu of your age is worse. The comparison trap opens wide to devour you. You view others’ accomplishments as indictments of your own deficiencies. Look at what all these other writers have achieved before they hit 40. You’re a loser verging on old-timer status. These thoughts are wrong, obviously. I recognized that right away. But even when you call a lie what it is, it can still harass you. As usual when these meltdowns happen, much angst and tearful conversations with my husband ensued. He was gracious enough to remind me of the truth and not whap me with it upside the head. It took a few days for God to uproot these areas of pride and misplaced identity and show me the better perspective. Writing is a wonderful creative outlet for me, as well as a beautiful instrument to convey truth about Christ and encourage others. It isn’t my purpose, though. It can be meaningful, but it doesn’t give my life meaning. My worth is in Jesus. He made me; he saved me; he’s working through me to accomplish his will. Why in the world do I forget this so often, at nearly 40 years old? Turns out the process of growing more like Christ takes a lifetime to progress. I admit to not wanting this goal most of the time. My heart is too darn selfish. But I can remember it, repeat it, meditate on it, talk about it, plaster it on my laptop, fridge, and bathroom mirror – anywhere and everywhere – to provide constant reminders of my ultimate goal in life. This is how it should be. This is what I live for. This is why I write, or do whatever my hands find to do. To please my Savior. To whomever reads what I write and joins me on this journey of transformation, thank you. I wasn’t a cheerleader, but I don’t have anything against them. I mean … I might find them a tad annoying, but just when they overdo their performance beyond the average person’s tolerance level for perkiness. One major impetus for this maternity pep rally is retaliation against those who shame other moms for any and all possible reasons, making them feel awful and look like sad sacks of child-rearing-failing crap. This account of the mother of Jesus should evoke sentiments of admiration, humility, and flat-out awe. Yet after sobbing my way through multiple Christmases without a child to call my own, what were my thoughts on this blessed woman? Stupid Mary. She got pregnant without even trying. The good news is that the Bible directly addresses the topic of infertility, recording stories of couples who struggled to conceive. The word “barren” occurs 24 times in 24 verses in the New King James, according to a quick Blue Letter Bible search. While I’d love to delve into all the implications this raises, I’ll just shoot Beth Moore an email asking her to do an in-depth study on infertility in the Bible and focus right now on the women Scripture highlights as those who wrestled with the inability to get pregnant. “Wrestled” doesn’t do justice to describe the way some of these women acted. First off, you’ve got Sarah, the wife of Abraham, the forefather of God’s chosen people. She persuaded her husband to sleep with her maid to produce an heir, then basically exiled the maid out of jealousy (Genesis 16). Later, when God Himself came and told Abraham that Sarah would have a son, she laughed and cracked a self-accusatory old people joke (Genesis 18). image courtesy Bible Top Ten. Then there’s Rachel, who hoarded an arkload of mandrakes, the naturopathic fertility cure of the day, and took nagging to a whole ’nother level as she complained to her husband, Jacob, “Give me children, or else I die!” (Genesis 30) And of course there’s Hannah, who was such a wreck when she came to the temple begging the Lord for a baby that the priest thought she was drunk (1 Samuel 1). How encouraging are these stories? These ladies were as crazy as I was am. Others handled their trials with more aplomb. We don’t know much about how Rebekah personally responded to her barrenness; just that Isaac prayed on behalf of his wife and the Lord answered him (Genesis 25). The woman who became Samson’s mother accepted the news from an angel of the Lord that she would bear a son who would help deliver Israel, and believed that God would follow up on that promise (Judges 13). 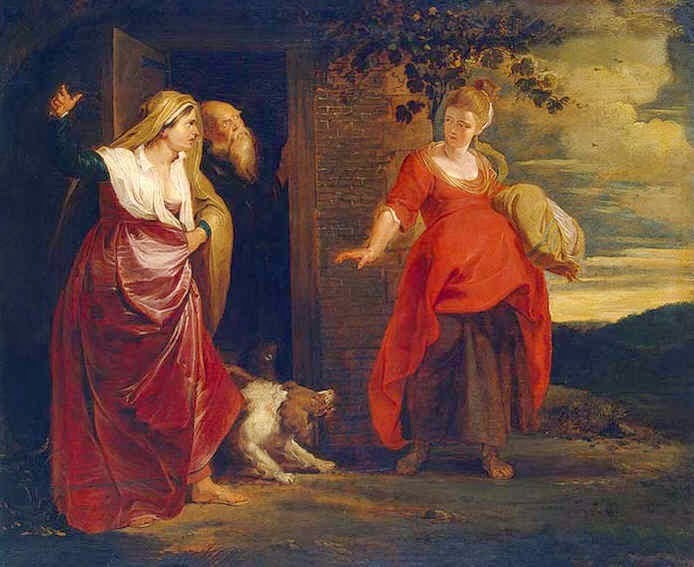 Zacharias and Elizabeth, who waited years for their son John to come along, “walked blamelessly in all the commandments and requirements of the Lord.” (Luke 1). God wasn’t punishing them with infertility; He was planning their pregnancy to come at just the right moment before the conception of His own Son. Um, what? Are we talking about the same Sarah who laughed at God, to His face? This chick belongs in the class of Mean Girls of the Bible, not among the great cloud of witnesses listed in Hebrews 11. Yet there it is. Sarah must’ve had some tiny measure of faith for the author of Hebrews to mention her. Remember, she did accompany her husband without any apparent complaint as they traveled through foreign countries to reach a promised land they never set foot in. She just had a hard time trusting the Lord about the whole baby thing. Friends who are facing the disappointment of infertility and feeling like you’re not hacking it as a believer in Christ, take courage from these passages of Scripture and recognize that you are not a failure. Let me say it again: YOU ARE NOT A FAILURE. Your body may not be working right; your hormones might be a mess; you could be giving in to the sinful tendencies we all struggle with and giving up on the faith that God is working all things for your good, but you are not a failure. You are human. You need a Savior – more than you need a baby – more than any of us needs anything in this life. So cut yourself some slack, sister. Accept the fact that His grace has got you covered for however long your waiting season is and beyond. Put your hope in the One whose love will never fail. And I mean it really didn’t work. Out of six eggs that were retrieved, only three of which were mature enough, none of them were fertilized. Even with the most advanced reproductive medical technique available – a procedure called ICSI, in which sperm are injected into the eggs – none of them were fertilized. We’ve achieved the ultimate fertility fail. The retrieval was not extremely successful, either. Six eggs were extracted, several shy of the usual 10-12, which the doctor thinks may be due to my endometriosis. On top of that, my blood pressure dropped when I tried to get up after the procedure, and they had to do a blood test to make sure I didn’t need a transfusion. I didn’t; I was just dehydrated and in need of fluids. Thankfully, my friend Elizabeth and her daughter stayed with me at the clinic while all this was going on and kept me company until Colin could get off work and take me home. When we left, the doctor said she expected from those six eggs, we’d probably get 1-2 embryos. I keep replaying this statement over and over again in my mind. Like the times when people have called to say that someone I love has died, I get stuck in that moment and feel nearly paralyzed with shock and devastation. I got off the phone and began sobbing. Colin held me in his arms and I wept until I felt numb. We sat on our living room couch for hours, while the sun went down and our phones kept ringing, not feeling like getting up to turn on the lights or check our messages. Poor Kaffy stared at us, whimpering, seeming to sense our anguish. Our little family stayed there, grieving in the dark, trying to process the loss of the ability to add to our family. Neither Colin nor I had high hopes of IVF working. We recognized the reality that at most, there was a 50% chance of us getting pregnant. So we were prepared for the pregnancy test to come back negative. We were not prepared for the possibility that we wouldn’t get any embryos, that we wouldn’t make it all the way through the IVF process. This probably doesn’t make a lot of sense to those who haven’t been through infertility, but in my mind, even having one embryo result from IVF would have been a blessing because it would’ve meant that Colin and I had at least one baby. And if we had been able to transfer the embryo, even if it didn’t implant, at least I would have been “pregnant” for a short while. Of course, going through all that and not having the embryo implant would have been a terrible blow as well because a little life would have been lost. One scenario isn’t better than the other; they are equally painful and disappointing. It’s just difficult not being able to complete a process that you have invested in so much financially, physically, and emotionally. It’s also hard to grasp the implications of the failed fertilization. Are my eggs and Colin’s sperm genetically incompatible? Is conception, whether naturally or in a Petri dish, physiologically impossible for us? It sure looks that way. I absolutely believe all the verses that say nothing is impossible with God. He’s the Creator of all life, for cryin’ out loud; it’d be ridiculous to think He couldn’t create a biological child out of our genes. It’s not a matter of power; it’s a matter of preference. For whatever reason, He is choosing to not give us a biological child. And that is the hardest blow of all. I have prayed over and over and over again for a baby, and He has said no. Colin has prayed, our families have prayed, our friends and several others we don’t even know about have prayed, and He has said no. He has answered many, many of my prayers for other issues in miraculous ways, and has always been faithful to love and take care of me even when I’ve been utterly faithless. He has rescued me from my sin and given me eternal salvation; I have nothing to complain about. I am not complaining that God hasn’t given me something I deserve; I am crying because He hasn’t given me something I’ve earnestly asked Him for, something that would bring me joy and bring Him glory. I know what some people will say to try to comfort us because I’ve heard these standby expressions before in other situations: “When God shuts a door He always opens a window” and “God didn’t answer your prayers because He has something better in store for you.” First off, these statements are not necessarily true – some people go through life one trial after another, experiencing terrible suffering that isn’t relieved until they get to heaven. Just think of all the missionaries who lived under persecution and were martyred for their faith. Secondly, these statements are not helpful or comforting. Right now, I don’t see an open window, and I don’t know what “better” thing God has planned for us. The future is uncertain; the present is painful. I believe the Lord has a purpose in choosing to not allow me and my beloved husband to conceive, so I don’t need any placating words of wisdom or suggestions as to what His reasons are. I just need time for God to heal my broken heart – my heart which He has broken. I need time to grieve over something I never had.